It was announced in a recent settlement that Gatorade made misleading "anti-water statements" while promoting its sports drinks in a video game played by teenagers. In doing this, Gatorade violated state consumer-protection laws by negatively portraying water in a mobile app that was downloaded by over 2 million users. 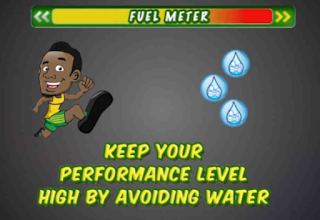 In the free mobile app, the likeness of the Jamaican sprinter, Usain Bolt, encourages users to keep their performance level high by avoiding water and using Gatorade to fill their fuel meter. The settlement was a $300,000 fine and Gatorade is banned from negatively depicting water in any type of advertising. The video game is now no longer available. A portion of the fine will go towards research on water consumption and nutritional health. Gatorade is also prohibited from advertising in media where children under 12 comprise over 35 percent of the audience. Comments from Allen: I have a problem here. Let me begin with the origin of Gatorade. Pennsylvanian funeral director, Angeliegha Stewart, has been charged with abusing corpses other crimes for 'allegedly' taking pictures on her cell phone of the dead bodies in her funeral home to "gross out" her friends and family. She is also facing a marijuana charge. The detectives found messages about deals while they were searching her phone during their investigation into the photos. Authorities say that Stewart took pictures during an organ harvesting process and others of a decomposing corpse. Other photos included corpses in caskets, and others not. A spokesman for the funeral home says that they are disappointed in the allegations and are cooperating with authorities. A small zoo in Maryland is once again facing violations of the federal animal-protection laws by mistreating lemurs, tigers, and lion. People for the Ethical Treatment of Animals (PETA), recently filed a lawsuit against a zoo owner claiming that he violated the Endangered Species Act because he had unsuitable enclosures without providing the right amount of companionship, enrichment, food, water and shelter for the animals. This impedes the animals' ability to carry out their natural behaviors, which puts their physical and psychological well-being at risk. In the past, owner Robert Candy has had claims against him for not properly caring for the animals in the zoo. In 2012, a judge suspended the zoo's license for 45 days for violating regulations of the Animal Welfare Act.